15th July 2014 - Catch Up® caught up! A very successful ‘Catching up with Catch Up®’ conference took place in London last week! The average delegate response to ‘How helpful has the day been to you?’ was 4.8 (with 1 being ‘least helpful’ and 5 being ‘most helpful’). 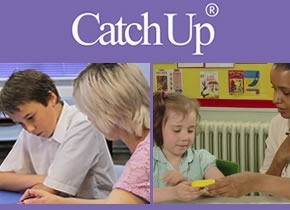 First, we heard about Catch Up® success in England, Wales and beyond, reporting that Catch Up® has now trained 20,000 supporting adults to date, making a difference to over half a million struggling learners! Sam Jones (Director of Literacy and Learning), Chris Bennett and Suze Stanley – from Callington Community College (Academy Trust) – spoke about their pupils’ very positive experiences with Catch Up® Literacy on transition from primary school. Their presentation included some wonderful video clips of pupils, talking about their experiences pre and post Catch Up® .The two schools were presented with Catch Up® Excellence Awards Certificates by Julie Lawes, Catch Up® Director. Look out for our ‘Catching up with Catch Up®’ conference in Cardiff on Wednesday 17th September. Please email us if you would like to attend.